-- Please Choose an Option --	1/2" x 1/2" x 1/2" 7/8" x 7/8" x 1/2"
Note: One (1) T-connection is already included with the purchase of any bidet seat in our store. This page is just in case you need another one. Need a spare T-connection for your bidet seat? One of our most requested spare bidet parts (probably because they’re hard to find! ), the T-Connection is used when installing your bidet toilet seat. There is a water outlet behind your toilet which is connected to the bottom of your water tank. This supplies the water to refill your toilet after flushing. 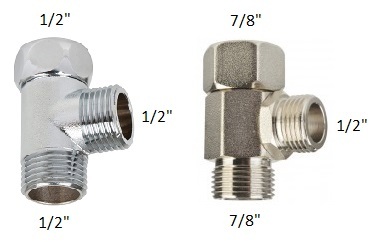 After turning off the shut-off valve, unscrew the connecting hose and attach the T-connection directly to the water outlet. This will allow the water to run two different ways - one way will be to the water tank, and the other way will be back to the bidet seat. Re-secure the hose to your water tank to the top end of the T-Connection. Attach another hose to the other opening, and attach the end of this hose to your toilet bidet seat. Open the water shut-off valve, and check for leaks. Congratulations on installing the T-connection for your bidet toilet seat! Service was good in getting this connection.